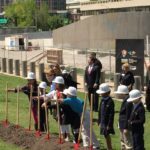 In celebration of the 50th birthday of the Gateway Arch, its 2.5 million annual visitors will be treated to a renovated and expanded visitor center and museum beginning in 2017. Groundbreaking for the project took place on the monument grounds on April 29, which marks yet another milestone in the ambitious $380 million CityArchRiver program that is transforming the downtown St. Louis area to improve pedestrian access to the grounds, improve vehicle transportation in the area, and spur economic development in the Gateway City. CMT staff members attended the groundbreaking ceremonies that were performed by local students. A key component of the CityArchRiver program is the Park Over the Highway (POTH) project, led by CMT, that is centered on the design and construction of a 280-foot-wide pedestrian land bridge over Interstate 70 that will connect the Arch grounds and the new museum entrance to the downtown area. The bridge’s deck structure is complete and work continues on the landscaping features that will include grass, trees and sidewalks. Transportation improvements – including the Walnut Street Bridge, a pedestrian bridge and nine intersections – are also key improvements underway. “I’m proud that we have had the opportunity to take part in this great project for St. Louis. From our downtown office, we get to see its progress on a daily basis,” said CMT’s Jay Rakers, a key project leader on the POTH project.